Anticipating the first rain in ten days and thanks to protracted daily power cuts, Dismas and I have attacked the Lantana brakes with a vengeance, in the week just passed. 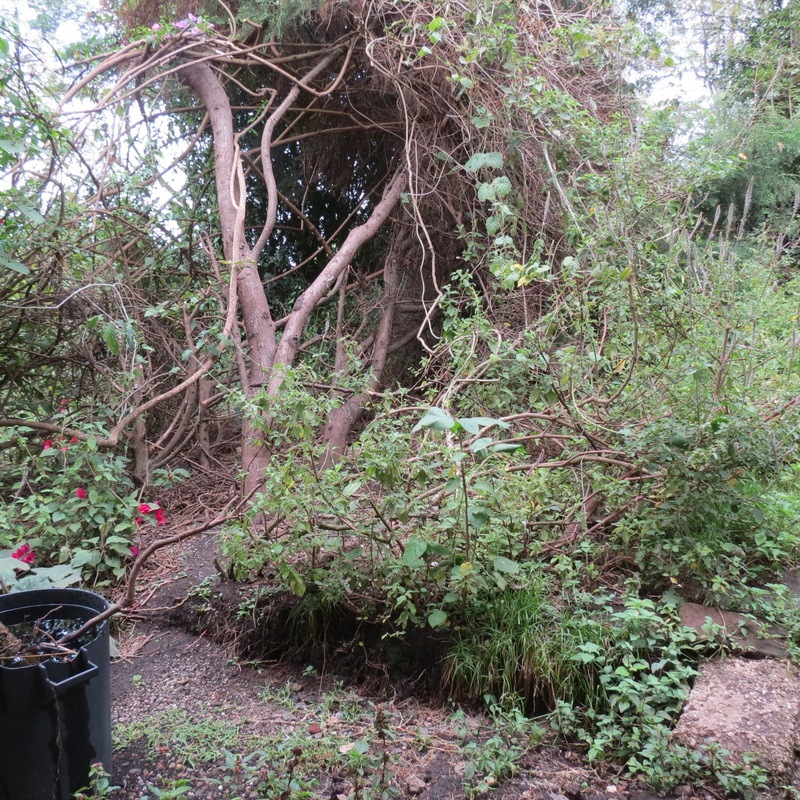 This rioting alien once known as the American Bramble has, since the plentiful Long Rains of March-to-May, completely choked the finest glades in my garden. 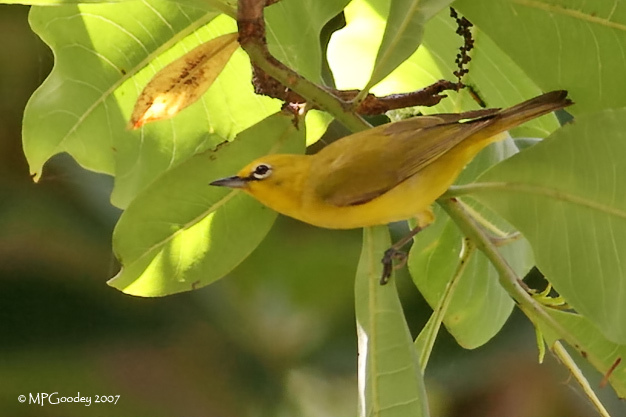 It has surged in all directions to consume all the best spots for Palearctic bird migrants – primarily birds of ancient wood pasture – glades painstakingly developed between 2009 and 2012. 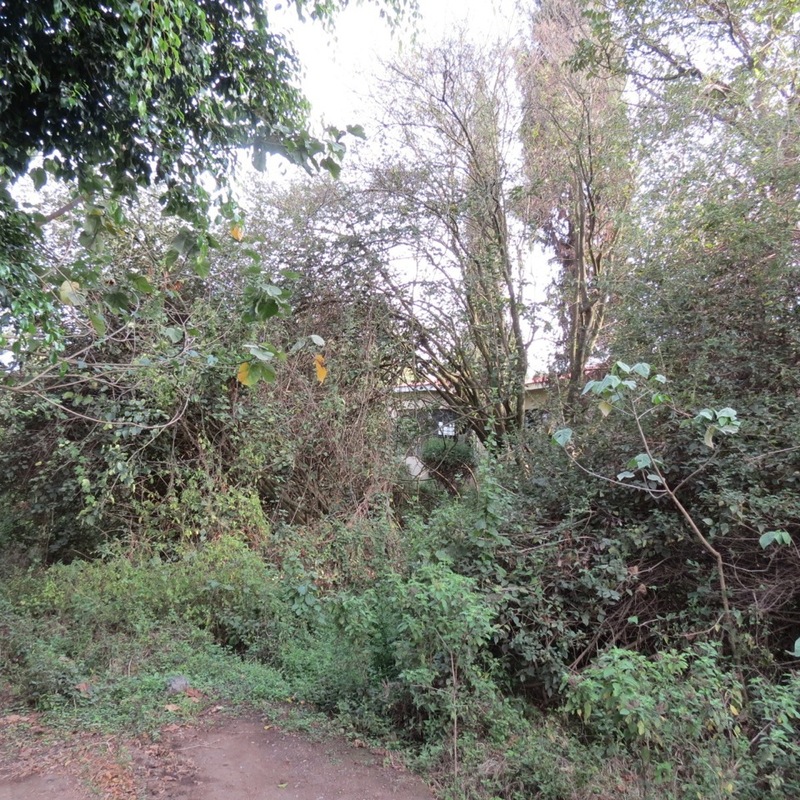 Especially significant is the glade that lies right outside the twin windows of our east-facing bedroom and Elsie’s consulting room of peace. So we attack the Lantana. More or less immediately upon arrival at the site, tools in our hands, Pi (our trusty Breton spaniel) discovers one of our neighbour’s three patchy grey and white cats, hiding, spitting in the shade. We see that the feline is suckling four still blind kits, in a rough den, on the eastern edge of one dense sprawler of a lantana thicket. 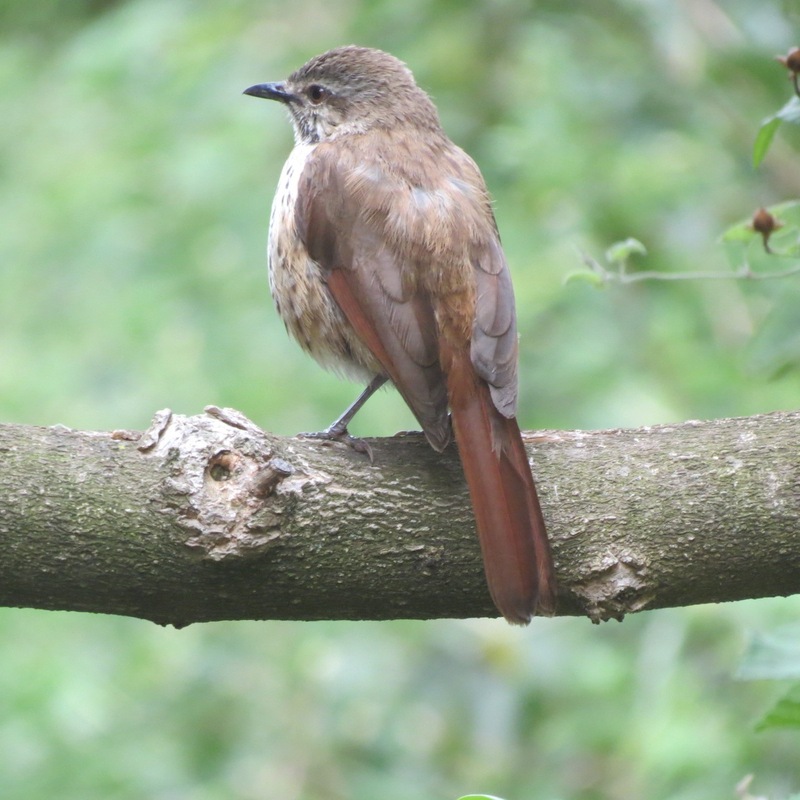 No wonder my beloved buffy Eastern Nightingales (golzii), now arriving at Mount Meru, and the more sombre grey-brown Sprossers, move-on the first night after their arrival. 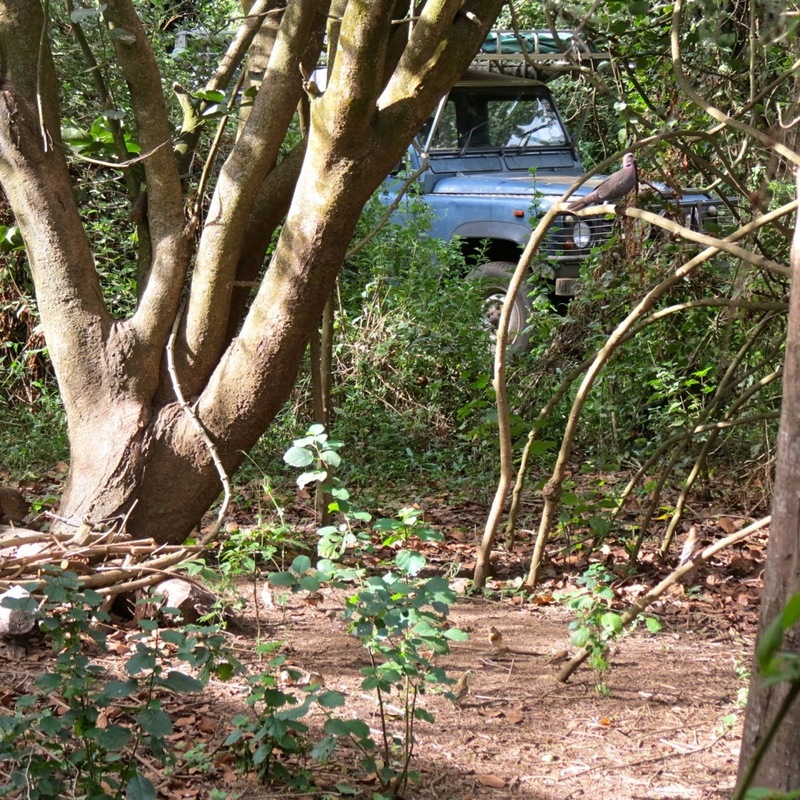 No wonder that our formerly resident Ruppell’s Robin-chats are no more, and no wonder the melancholy cooing Blue-spotted Wood-doves, a breeding rarity locally, have declined from three pairs in 2012 to one! At least the Cape Robin-chat, who serenades us for the entire work party visit, is able to find enough arthropod food within the taller Lantana thickets of the garden, where a woefully sparse ground flora nevertheless permits unhindered visibility of the oncoming moggy of feral-suburbia. We begin to tackle the Lantana in order to create an east-west ride between our northern hedge and a central grove of ornamental trees. As always (so it seems) it was alien saplings that the upwardly mobile owners planted long ago. Trees that nevertheless now provide the central arboreal feature of this “garden”. As we start a Eurasian Tree Pipit (the first of the return here) sweeps down, in bounding flight, to the centre of this wilding wedge, from the direction of the mountain. 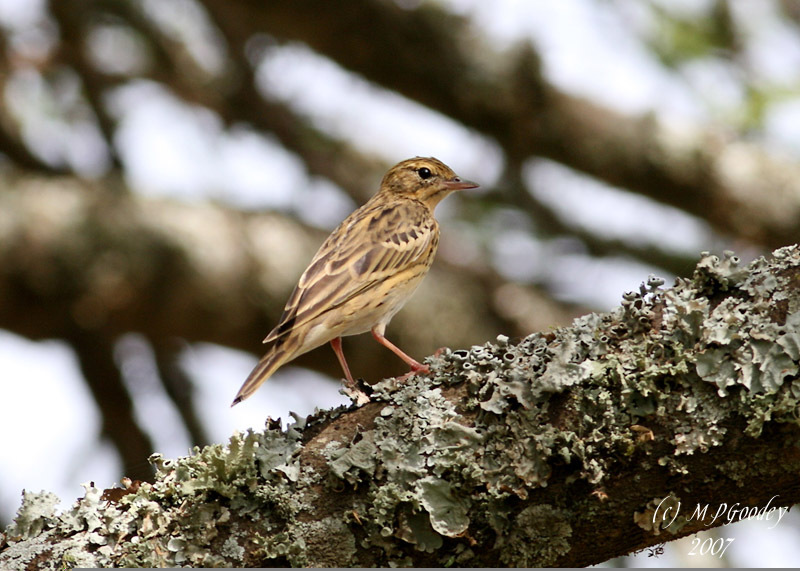 “Skeeze … skeeze” the pipit calls. It lands in a gnarled Grevillea of the northern boundary hedge, peering as if to survey the bending backs and benign handiwork. Unfortunately we have not been at the clearing long enough to create enough of a disturbed area to provide sufficient foraging opportunities and so after a minute of surveillance it flies on southward. “Skeeze”! 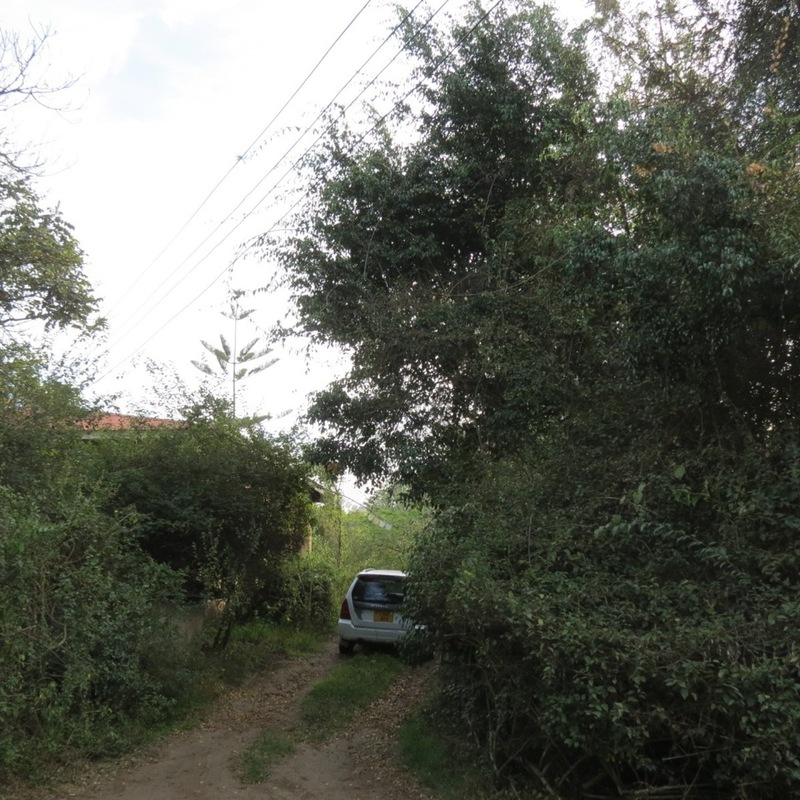 Five minutes later two White-necked Ravens shot overhead, their falsetto caws attracting my attention as much as the whoosh-whoosh beating of their wings, as they rushed, as only Ravens can, for the Marabou Stork hang-out of a knacker’s yard at Sakina hill, a kilometre deeper into town. 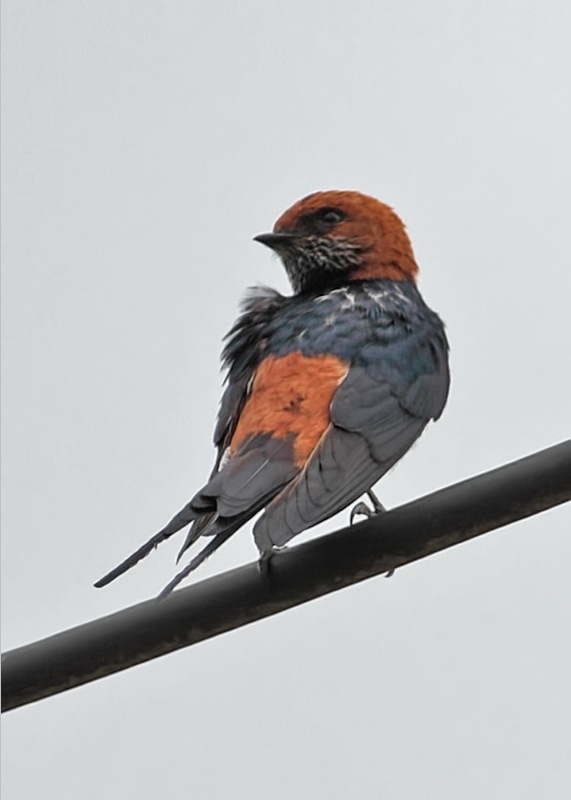 At the same time a male Lesser Striped Swallow, sensing the hike in atmospheric moisture, circles the garden calling with that rusty gate hinge call that signifies a nesting site is near. It’s just over the hedge in our neighbour’s water tower. And their last year’s nest has been eyed, on some recent evenings, by a displaying pair of African White-rumped Swifts. 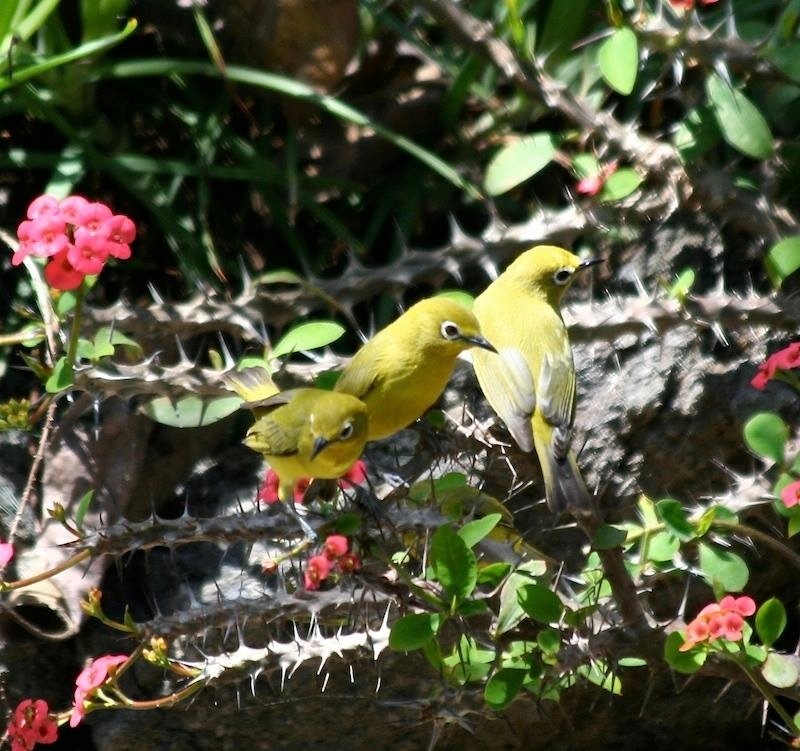 who pass each day, in both morning and evening, between foraging areas over my local patch in the Ngaramtoni korongo fields (= wadi of the birds) and an unknown roost site which I suspect is in the cliffs of Mount Meru in Arusha National Park. After completing my work, and as Dismas cleared away the cut Lantana rods, to be burnt as fuel to cook the food for our carbon-neutral flea ridden shenzi guard dogs, I wsatched acitrus Swallowtail laying eggs on an unknown spindly shrub outside the bedroom window. 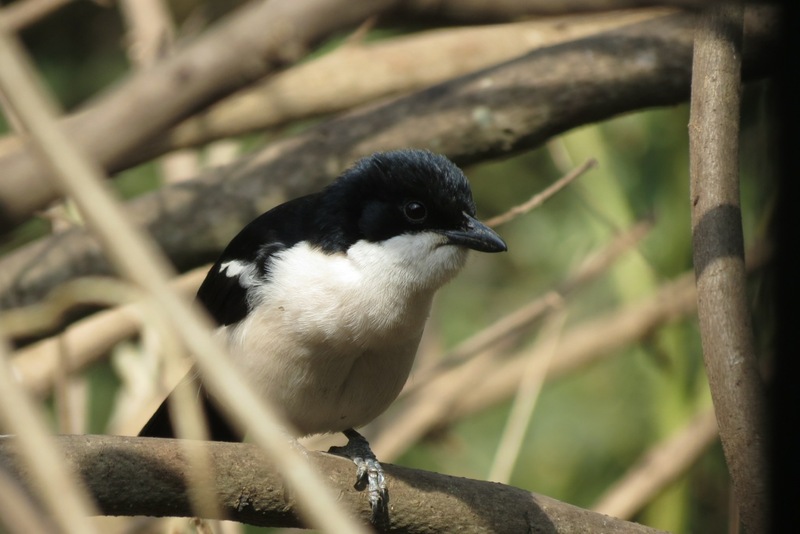 Suddenly a male African Paradise Monarch (flycatcher), the first full adult male – sporting ribbon tail and long white wing sash – to grace our garden, danced into view with those linen-ripping calls so characteristic of the genus Terpsiphone. Then a female flew past and with an audible click of the bill snapped, somewhat optimistically I thought, at the large, slowly fluttering swallowtail. It missed and landed on a bar of the open window only a foot in front of my belly! This was the second time in three hours that I could have touched a forest insectivore. 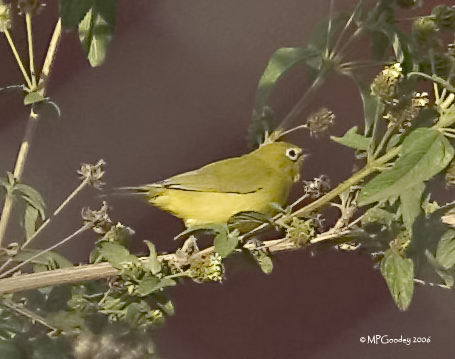 At about 8.30 a Grey-backed Camaroptera, with squeaky “Bleating Bush-Warbler” calls and noisy wing-snaps had flown into the Lantana I was cutting to feed around my feet. We must be doing something right. As we simulate Giant Ground Sloths, from the jungles of Guyana, trundling about their range, to browse and break the spiky Lantana for a commonwealth of species. Reuniting Gondwana in spite of man unkind! 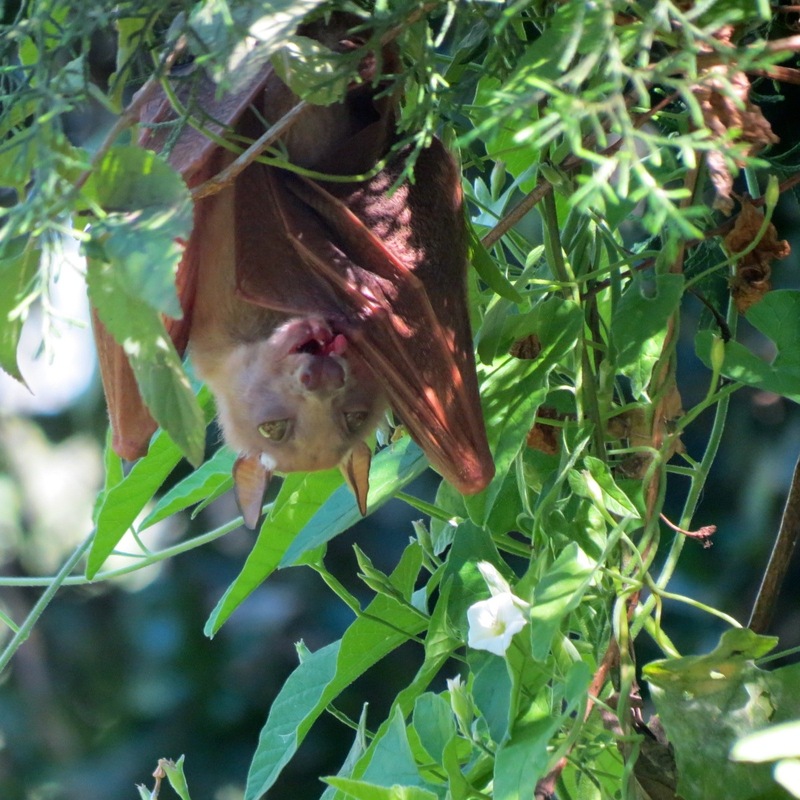 Just after breakfast on Friday, at a kitchen window rewilded, greetings from an Epauletted Fruit Bat a-grooming. If there is one species of being for whom I break my skin in the garden, apart from for my own sanity, then it is Cichladusa guttata. 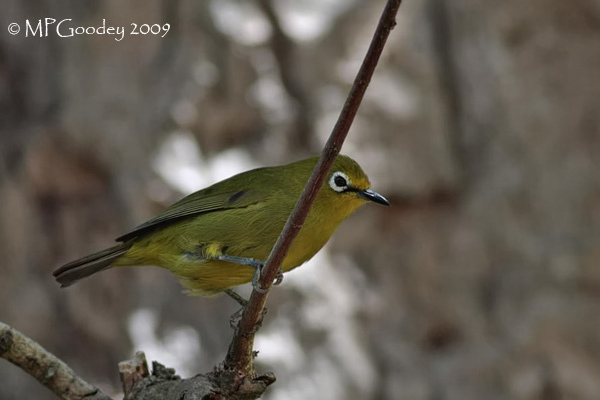 In the English language, variously across time and Africa’s space, they have been called the Spotted Morning-Warbler, the Spotted Morning-Thrush and latterly the Spotted Palm-Thrush. This then is THE bird here amongst the unkempt ecological renaissance of my “Wilding Wedge”. 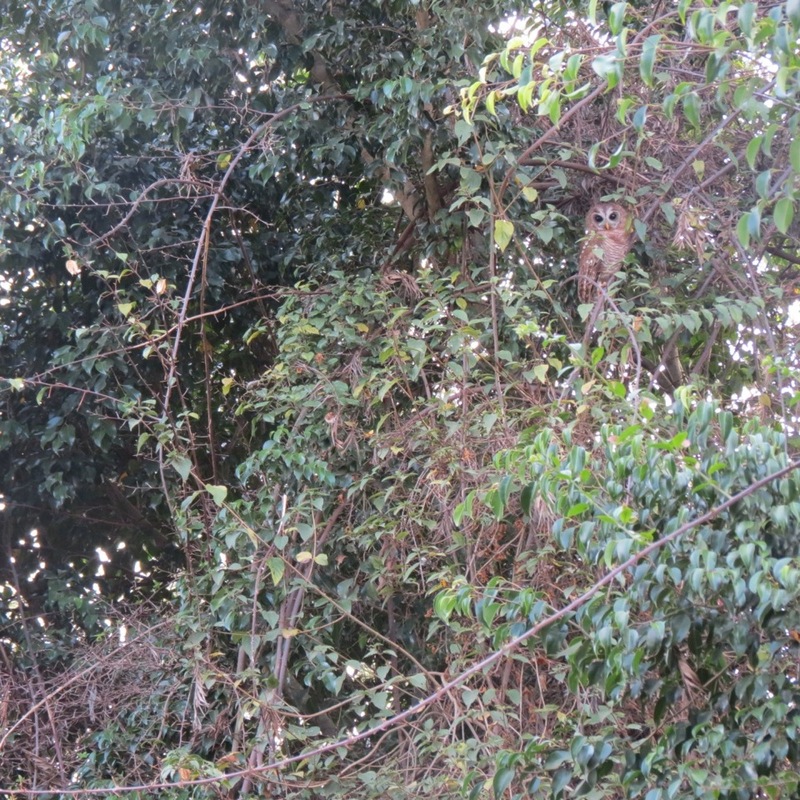 This morning (19-Nov.14) the pair at my kitchen door step (as pictured below) were singing together loudly at 0525 well before a sluggish grey dawn slid along the southeastern horizon. So today I decided to share with you their modest, yet highly endearing, appearance. This garden is the only place where I keep a bucket list – although in keeping with our civilization’s attitudes it’s actually more of a dust-or-garbage bin list ! They must have outstanding hearing, and certainly they have a splendid syrinx for they can imitate other beings almost as effectively as does any Robin-chat. It gets confusing, as in our garden the current residents seemingly inherited imitated song patterns from their parents, who had first copied the sibilant squealing of one of our puppies some six years ago, and now the new generation has adapted and reworked those squeals to suit the changing times. Similarly they have copied the anxiety call of the Rueppell’s Robin-chats, now sadly extirpated by the recent rapid increase in house cats as our neighbourhood becomes somehow suburbanised. Endemic to north-eastern Africa the Spotted Morning Thrush is definitely one of my favourites. 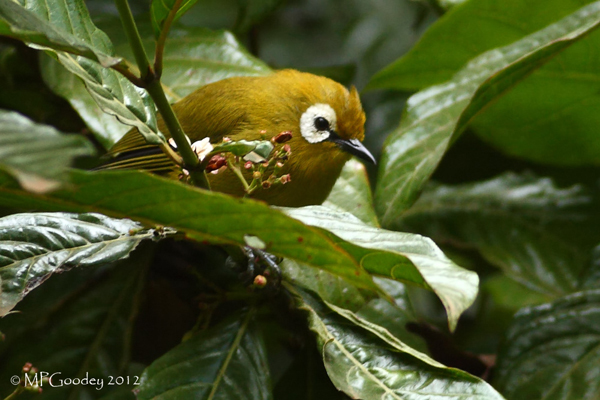 Should I ever leave tropical Africa this is an avian companion who will for sure be sorely missed. Morning Thrushes touch all compartments of a birder’s heart. 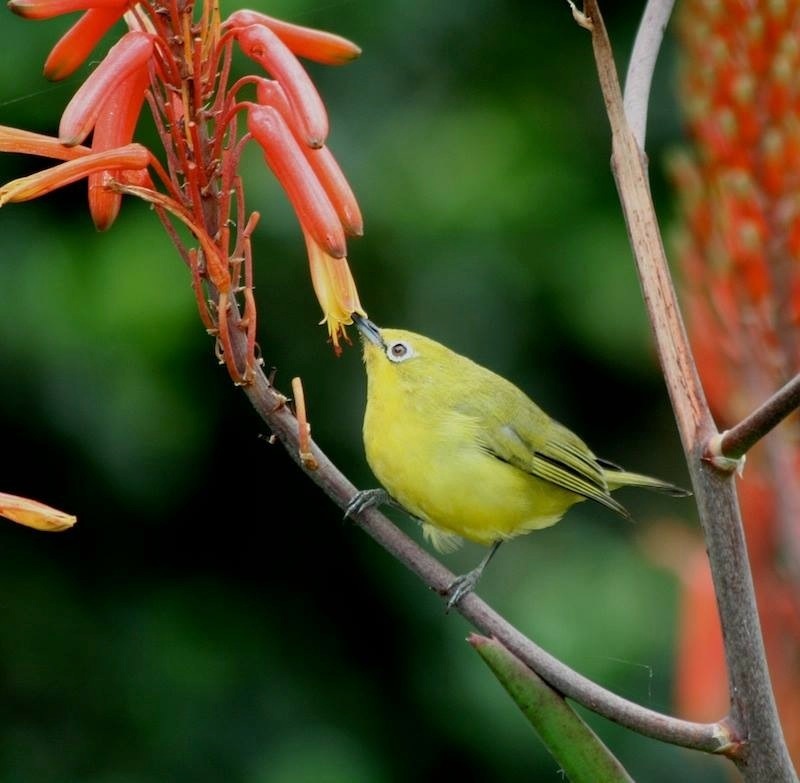 To start with they are ‘Range Restricted’ by regional endemicity, then they are retiring birds, hiding behind a typically skulking nature, mind that’s no longer true here at the eco-oasis. Most of all they seem to offer us their platinum voice. A song that incorporates superb antiphonal duetting, employs a ventriloquial voice of such pure liquidity that even the seasoned listener may be rendered speechless! They mould a fabled oven-bird-style cylindrical nest, solely of brick red mud, cemented to a branch, remarkably like those old fashioned disposable earthenware tea cups fondly remembered from the railways of India. Into this cup they lay two usually unmarked sky blue eggs. Added to all of this the Morning-Thrushes exhibit a certain ‘politeness’, a demeanour that is all too seldom achieved in the rough and tumble birder’s world of these precarious days. 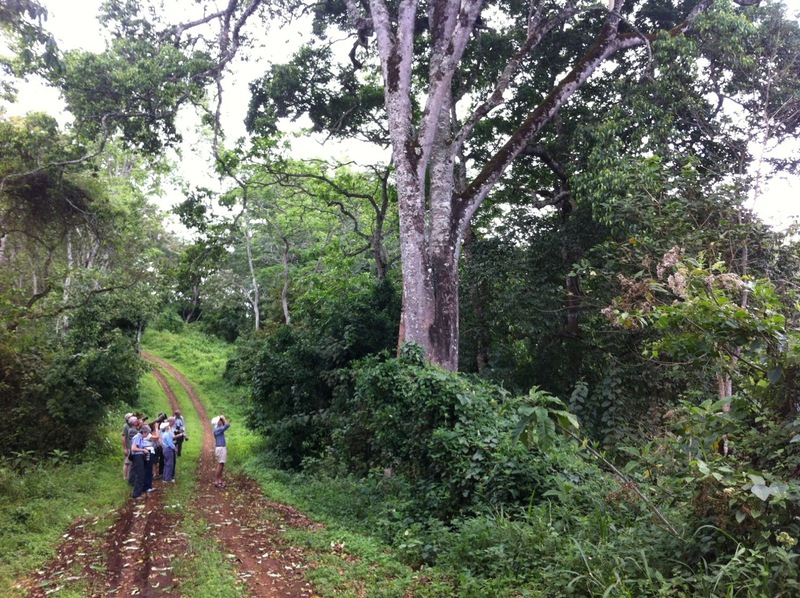 A wildlife tour group, as here, is escorted by an armed ranger to protect them from wild cattle (i.e. 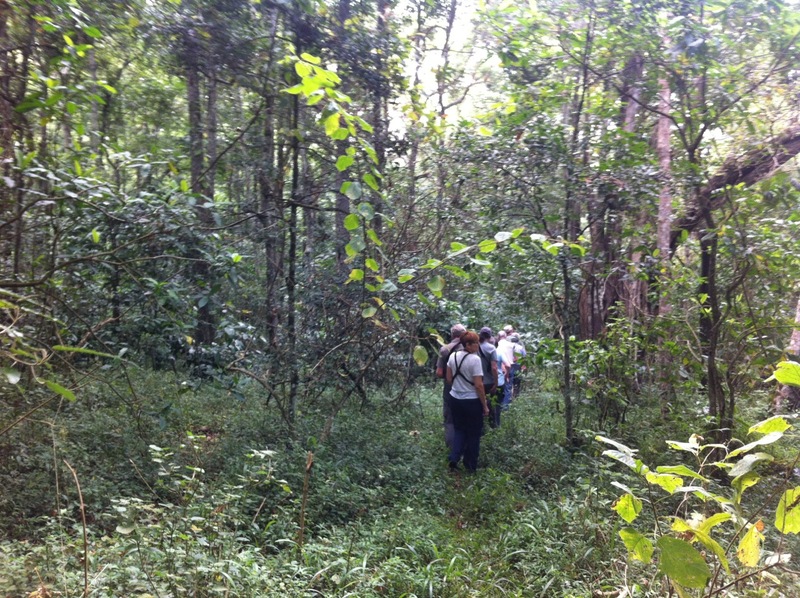 African Buffalo) into the deep and shady evergreen forest of Arusha National Park in northern Tanzania. 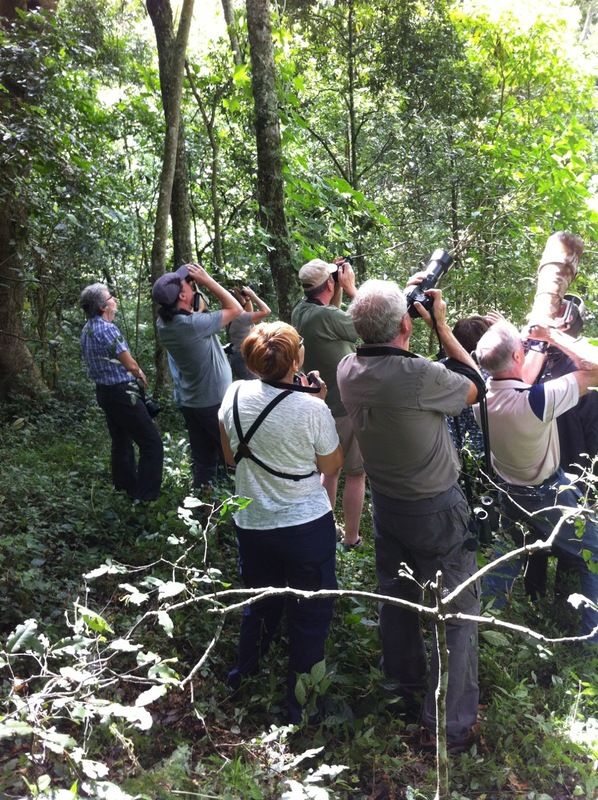 Here we may observe not only leaf-chewing Colobus Monkeys and Gentle Monkeys, up close and highly personable too, but also a great variety of afrotropical forest birds and some magnificent butterflies. 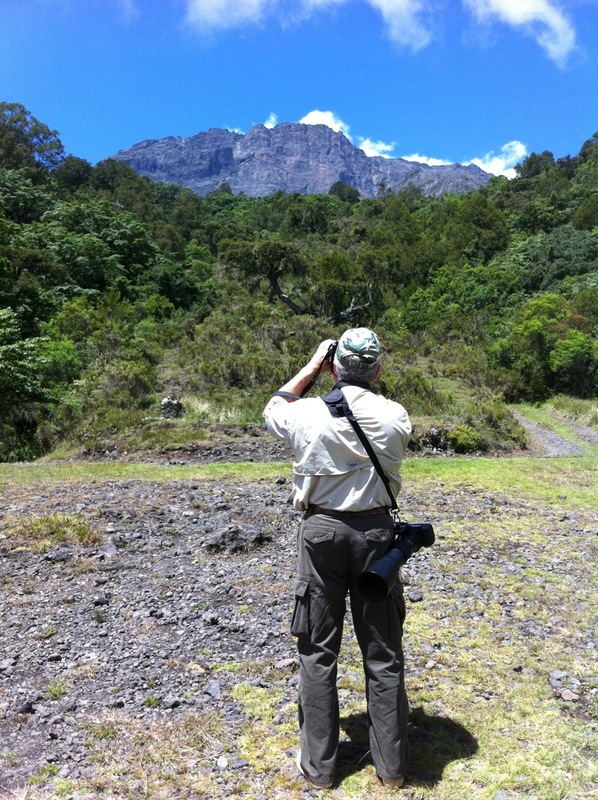 We can’t go birding in the National Parks and protected areas as often as we would wish. So we must bring Nature to our doorstep. To garden effectively for wildlife I have found, since 1983 when I started “Conservation Gardening” back in England, that one has to throw out a lot of ecological preconceptions. The first and most important lesson is understanding that most ecosystems need some serious cyclical disturbance in order to be more fully productive. 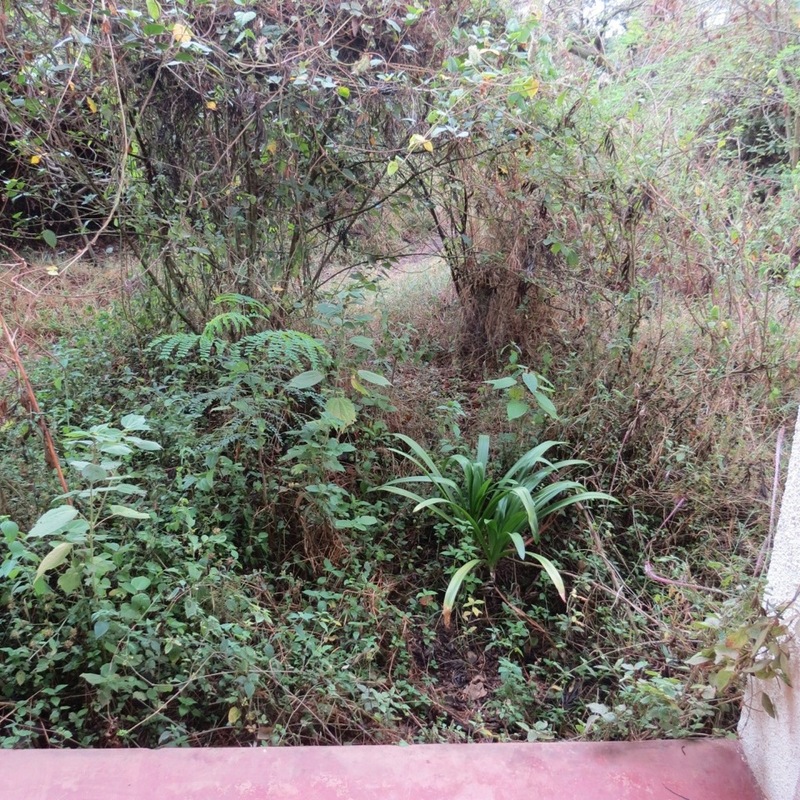 Here you can see some recent, pre-rains, disturbance outside our front steps. It’s not everybody’s ‘cup of tea’ but certainly hooches with wildlife. In many ecoregions ideally you’ll need some kind of cattle. But in the absence of unmedicated cows one has to improvise. Obviously we’re not having anything to do with biocides such as avermectin or diclofenac et al. which may render cattle dung extremely toxic to most fly and beetle species. Cows are the single most important mammalian bridge to healthy diversity. For thousands of years they have been a link between our “ersatz ecosystems” of organic farming, gardening and the former “wild wood”. 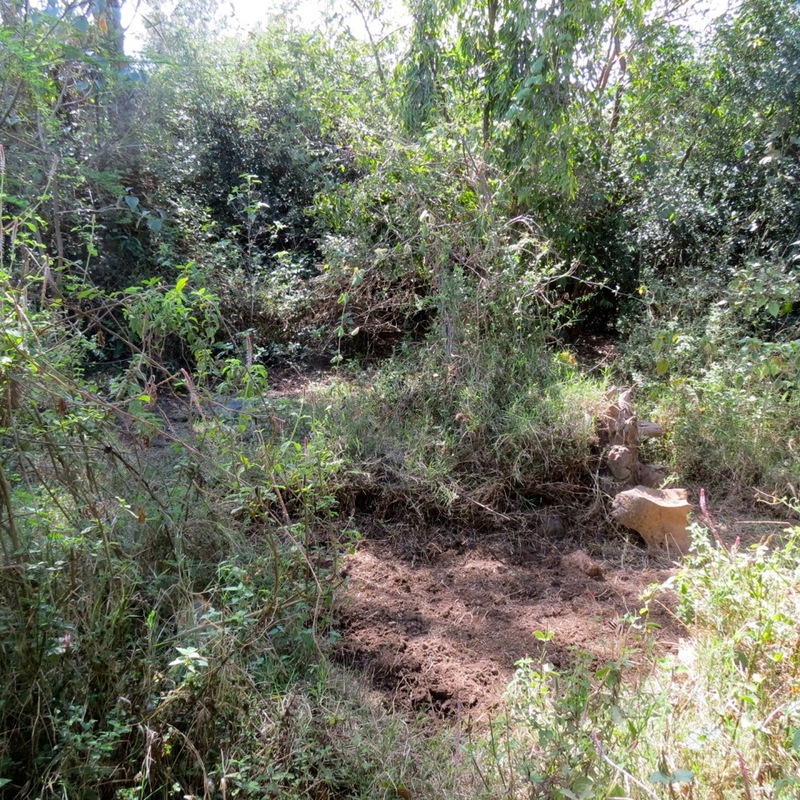 Without room for cattle we import their “waste products” from a nearby farm and attempt to replicate their trampling, wallowing and browsing just as if they were here – walking daily through “our garden”. It’s not an easy task, but it is much better to be a Copy Cow than there be no cattle action whatsoever in the garden. Alien plants are tolerated to a degree if they support a significant number of animal species. However in the case of Lantana camara such tolerance requires extreme vigilance, and daily intervention, as this species can grow at nearly a centimetre a day in the warm wet season of November-February. Indigenous cereal seed is scattered at certain times of the year to attract granivorous birds, such as doves and weavers, who in return gently fertilise the woodland floor, after their morning feeding period, particularly below their favoured perches in the canopy. 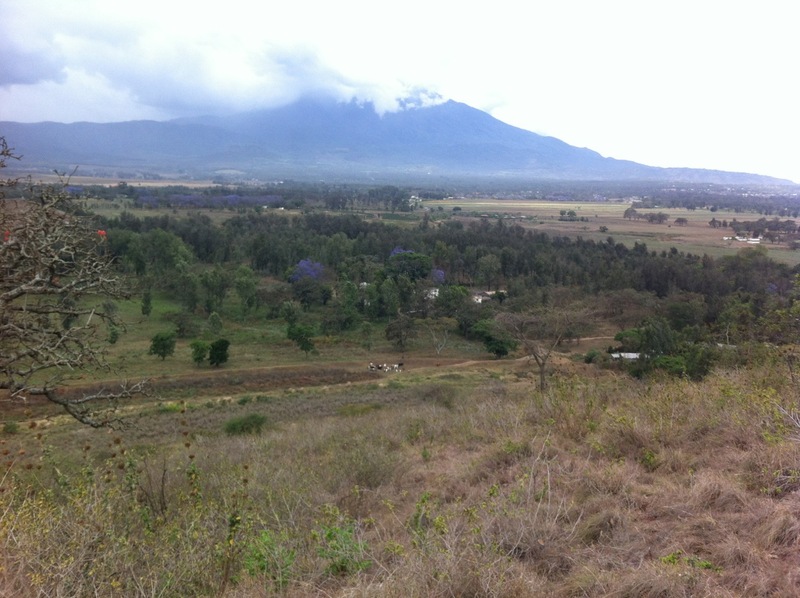 Mount Meru viewed from the edge of the Aga Khan University estate. Our Wilding Wedge of a garden is in the shamba-suburban foothills under that lowest wisp of cloud. For over a month I’ve been getting the garden ready. 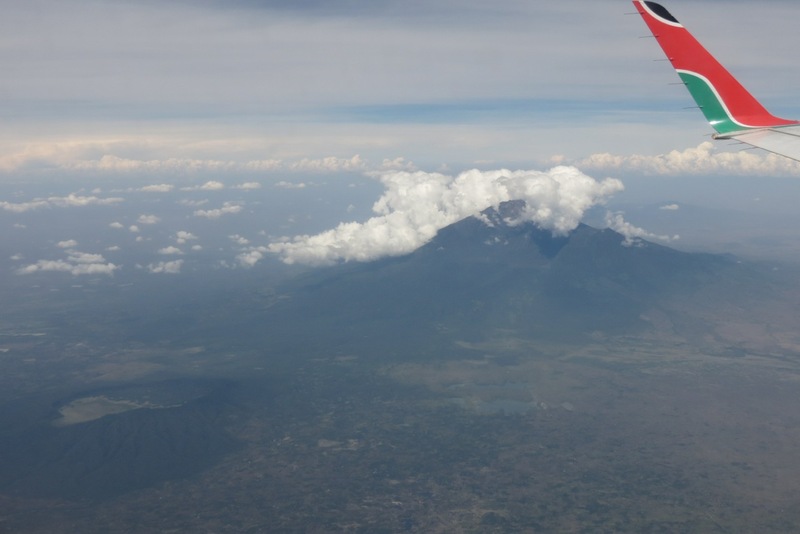 Our wilding wedge beneath the steel grey pyramid of Meru. 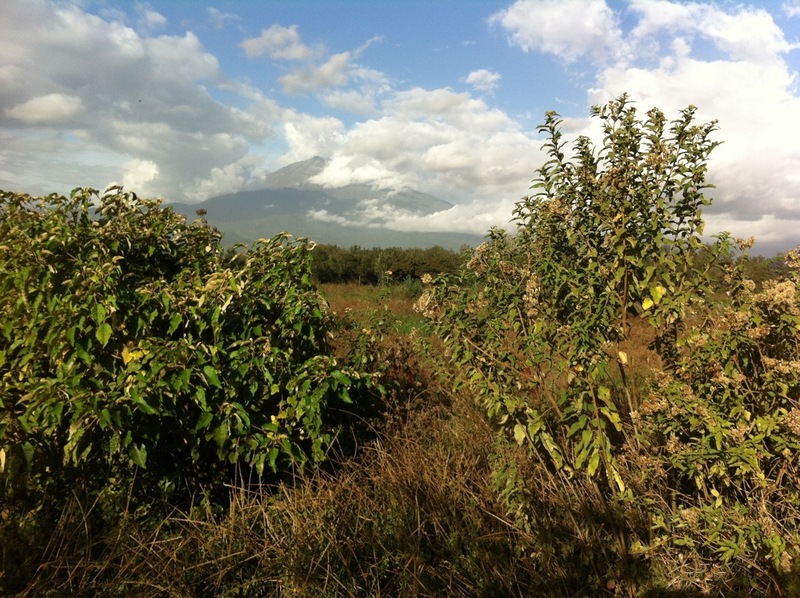 A rented hectare outside Arusha in East Africa, at a kilometre and a half above the sea. It’s an ever-changing tangled patchwork of exotic, alien hard-browsed Lantana camara in glade-thicket-and-brake. An experiment in non-racist eco-gardening, style ZooBotany-C21. An experiment by the Woolly Rhinoceros himself. A garden of vines, creepers and rank meadow flowers sheltering soft shaded fungi and an impressive annual increment of often noisy mini-beasts. 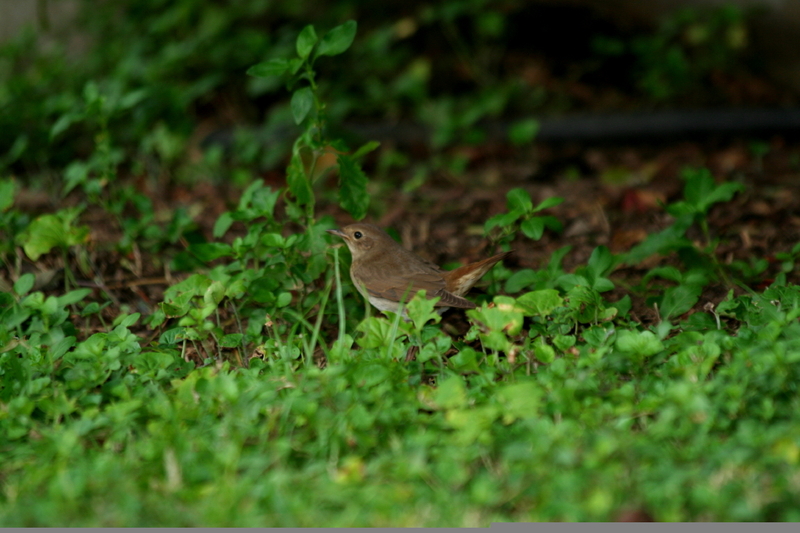 Thrush Nightingale photographed in the garden of Geoff and Anabel Harries, in Arusha. Below all it’s a life amongst and under trees. Exotics, aliens and, for the past seven years since we moved-in, the “Indigenous Pioneers” protected by guerrilla units of the IVF – the Indigenous Vegetation Front. There’s Croton of two species, the stately large-leaved Cordia africana, many little babies of the toweringly exquisite, formerly revered Newtonia. 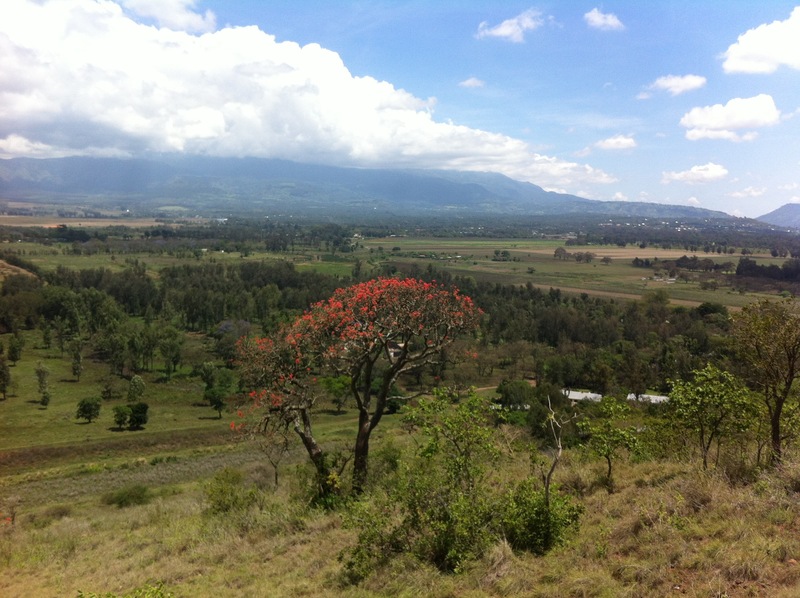 A tree of spirits revered around WaArusha and WaMeru farmsteads prior to the conquest of East Africa by the Middle Eastern God, and those godless Mammonites who followed Him. And more recently there’s been lots of hazel-like Sandpaper Bush springing up around the plot. Yes I’ve been getting it ready. Readying a garden fit for Nightingales. The garden as seen from the balcony near the front door on a recent grey morning. Today’s Eastern Nightingale was under a bough in the top right corner of the photo. So we’re now officially ready to help those sweet thrush-voiced grey-breasted nightingales, here for the duration, from the Baltic states and Russia Luscinia luscinia, and the cleaner looking, fawn-topped Mongolian nightingales L. – megarhynchos – golzii. As they help me. And to help those passing eye-browed blue Irania, out of some desert ‘stan, as they help me. 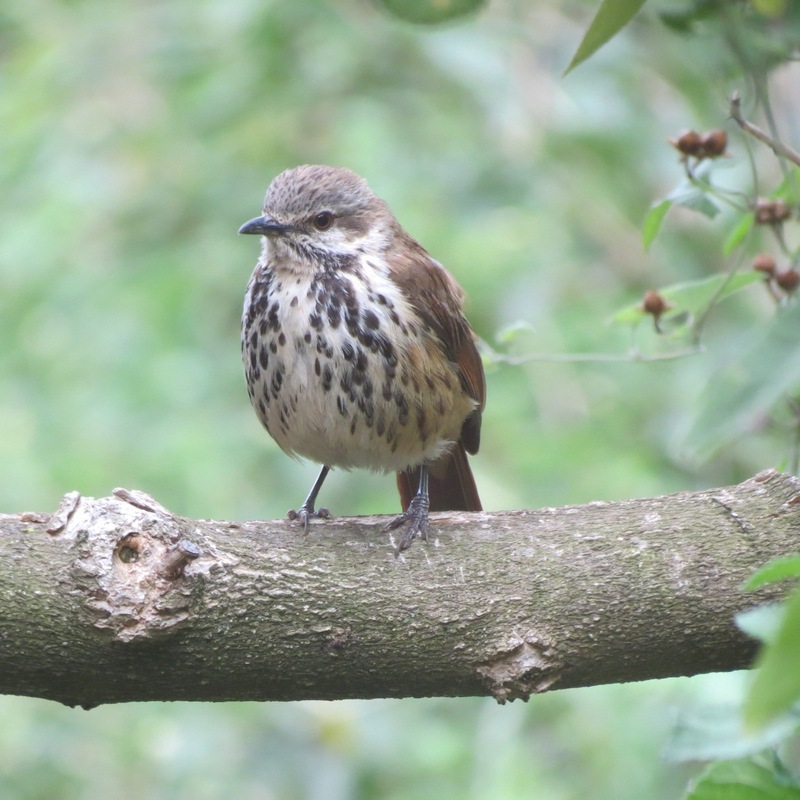 Or gentle grey striata flycatchers, who’ve flown here from the as yet relatively healthy eastern edges of EU-trophia. I imagine the places. Places not unlike those I recall from a mixed-farming youth, where milk cows amble up and down the lanes, browsing the hedges as they go, where cattle generally are still allowed to host the occasional gut parasite, such that their dung is no longer toxic to all those fly and beetle species who were (formerly) tasked with recycling it. Semi-organic land, of farms where BIGPharma has yet to squeeze the living countryside. Land not yet hollowed-out, or enclosed and then constricted, in the hallowed name of Growth for Profit. Yes, here’s some blasphemy, as we prepare Farmageddon. 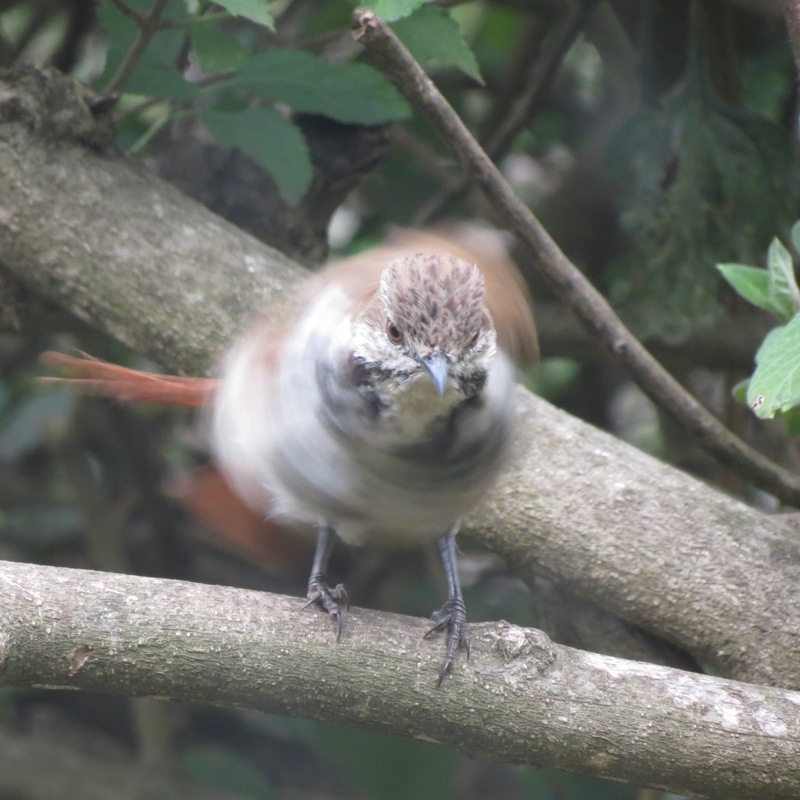 I’m here to help skulking lbj warblers, migrants who still eek out a living amongst Eurasia’s mercantilist confusion. 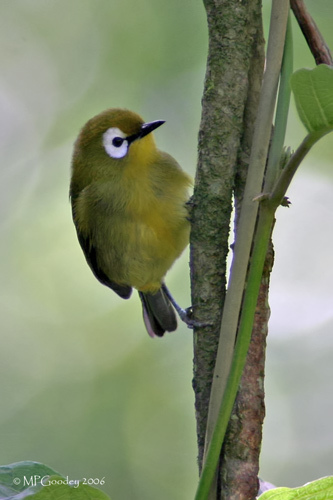 And to help vociferous glittering gems, Afrotropical cuckoos, that fly here to parasitise our breeding birds, after a dry season spent bashing caterpillars against twigs in the leafy heart of the great Congo forest. Just as they help me! All of them. Let’s not forget the flitting swallows, the scything swifts and ethereal floating nightjars, all of them, these migrant birds. 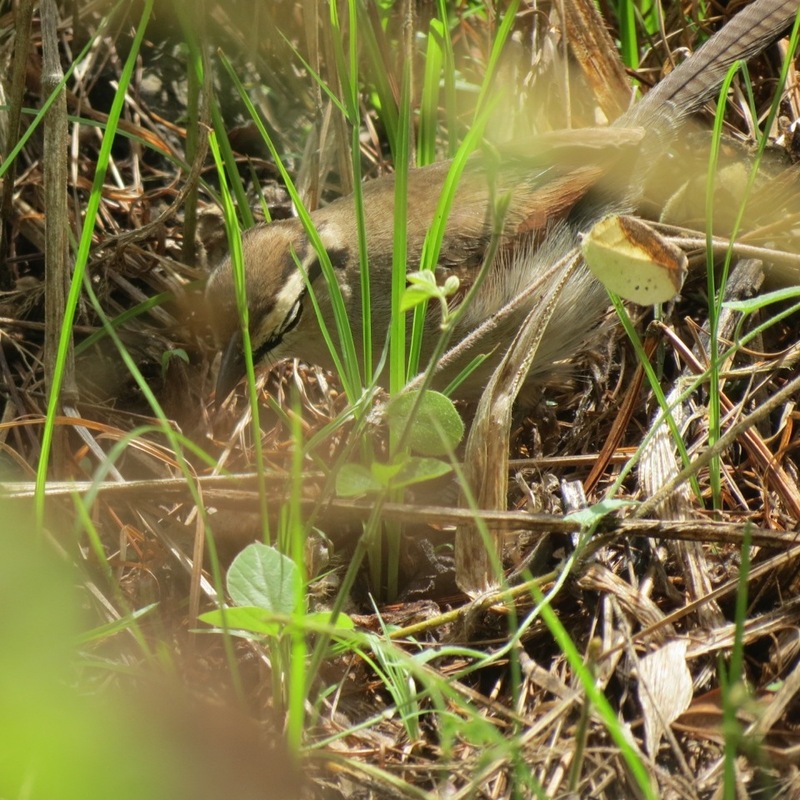 Feathered lives from far away, hatched in nests they’ve hidden where only the geotrackers go! 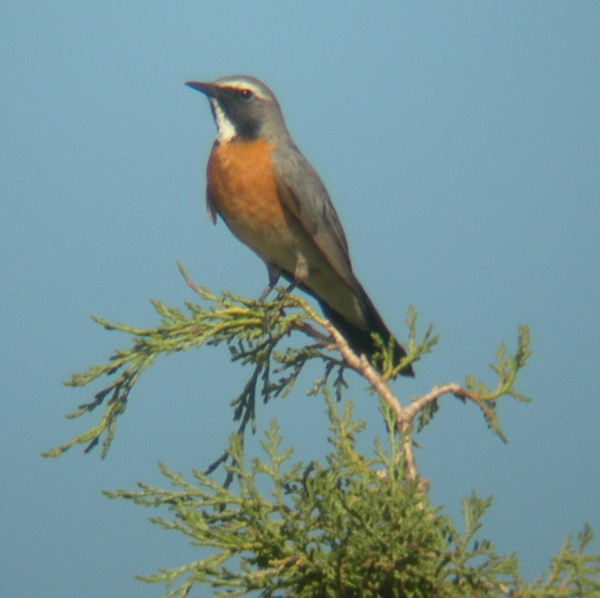 A male Irania ‘performing well’ on a juniper in Uzbekistan. Photo: Steve Rooke. Just as they help me. Yep! It’s been a Birden of Love. Since November started, most days it rains. And my avian rewards they are dropping in. The original Manna from Heaven. 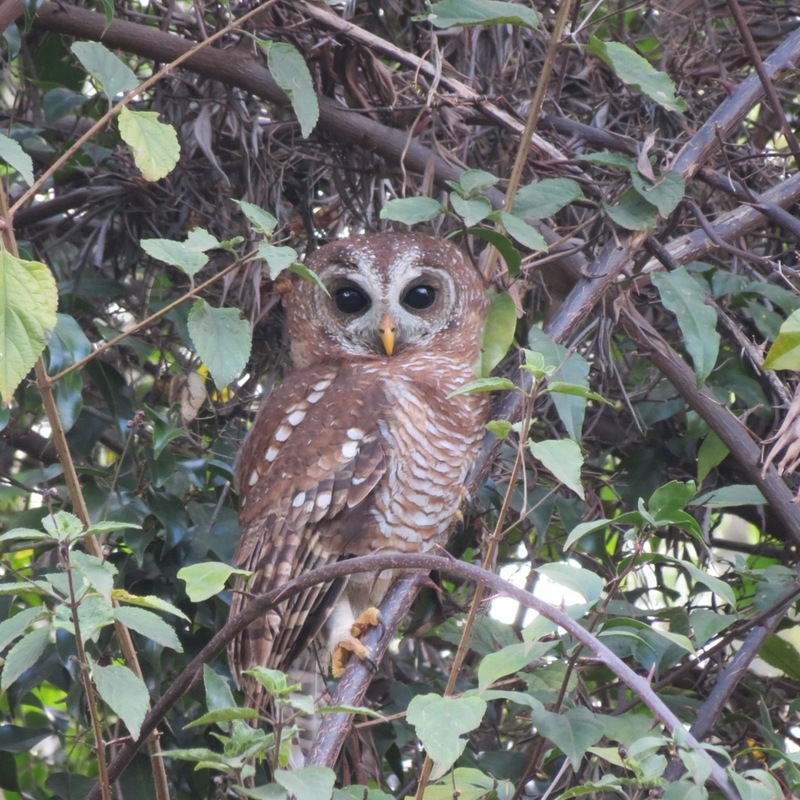 Just today, on November 6 in the morning, not half an hour ago, when the dark rains eased, as I was snapping spindly Lantana shoots beside the puddled green cement of the basketball court, there was a sharp flutter of wings – right against my ear. And there on the bough just ahead of me, at eye level, was the perfect eyebrowed fawn-and-tan form of a “chucking” Eastern Nightingale. I watched entranced as that out-of-the-sky golzii bounded along the grey lichened bough. A gorgeous bundle of energy. A small bird, relieved, a bird who might have been singing late last May along a briar bedecked stream next to a Mongol yurt. 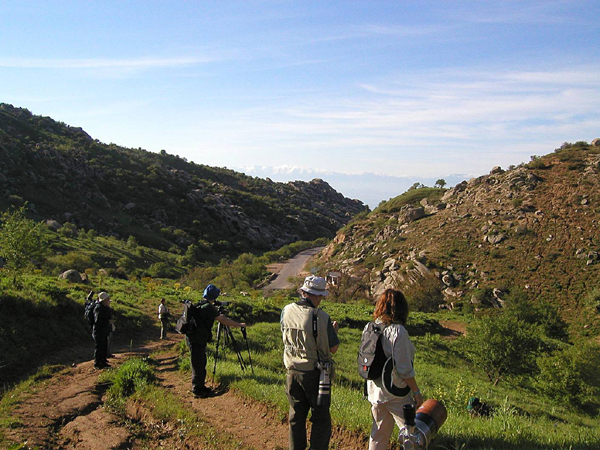 Birders on a Sunbird/Wings nature holiday scan a valley near Samarkand for Central Asian specialities which mostly winter in Eastern Africa. The mountains of Tajikistan are just visible in the background. Photo: Steve Rooke. 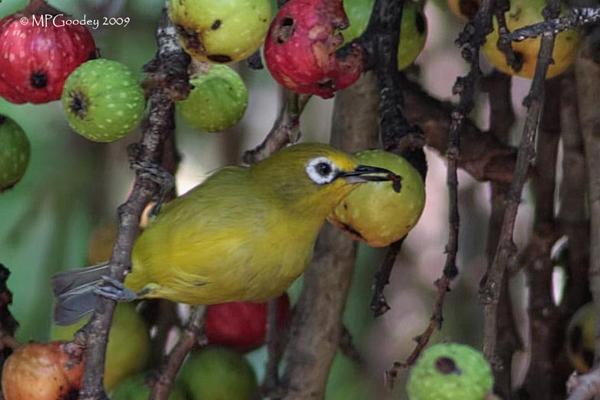 That’s why I so love these long distance migrant birds. In an instant they can fix us in the living, utterly interconnected, planet. So I can’t help but think. 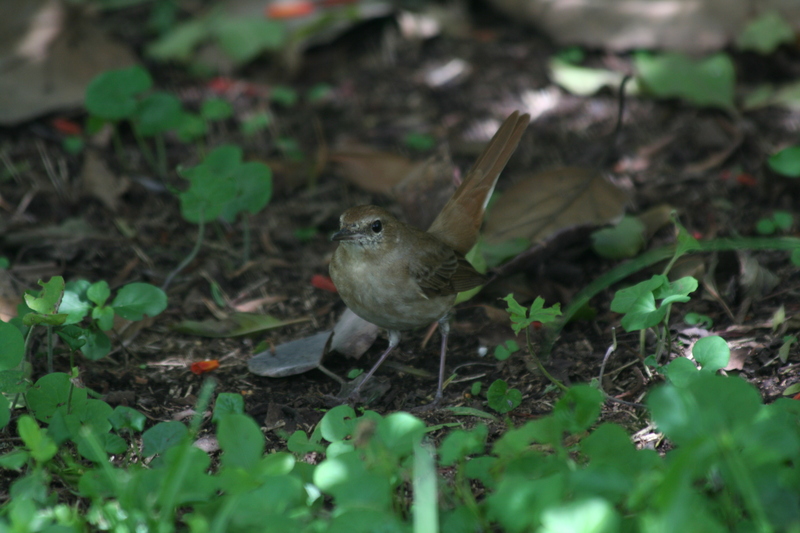 Where was that Nightingale skulking at Halloween, or on Midsummer’s afternoon, where was this lovely nightingale on passage last May Day? 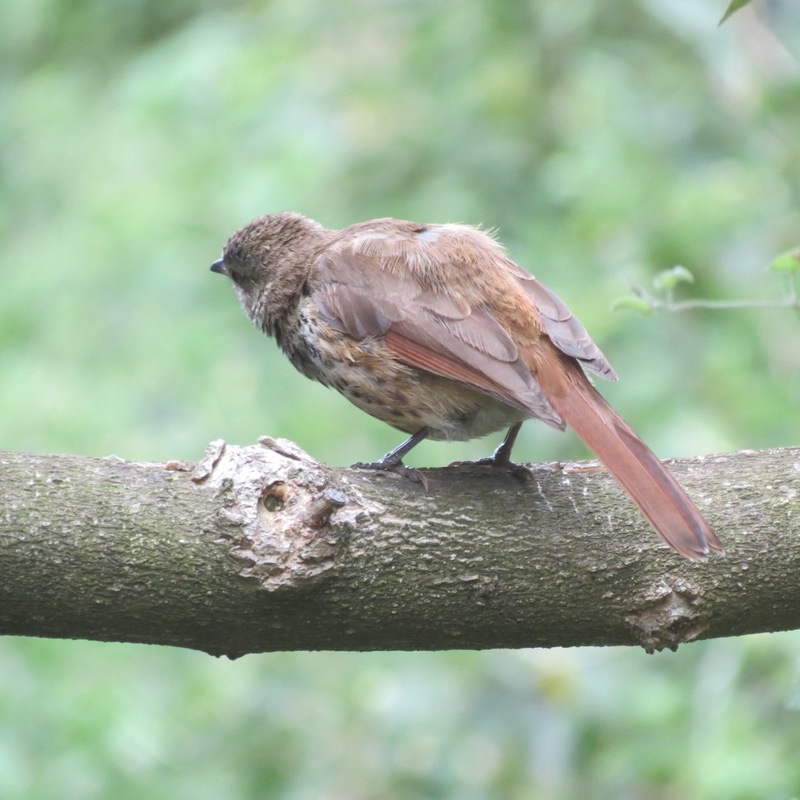 Yes, what was the world like, where this little brown bird was then? The same but a different world – somewhere – out there. Out there far beyond this garden hedge. Way beyond my ken, but still sheltering in my heart. 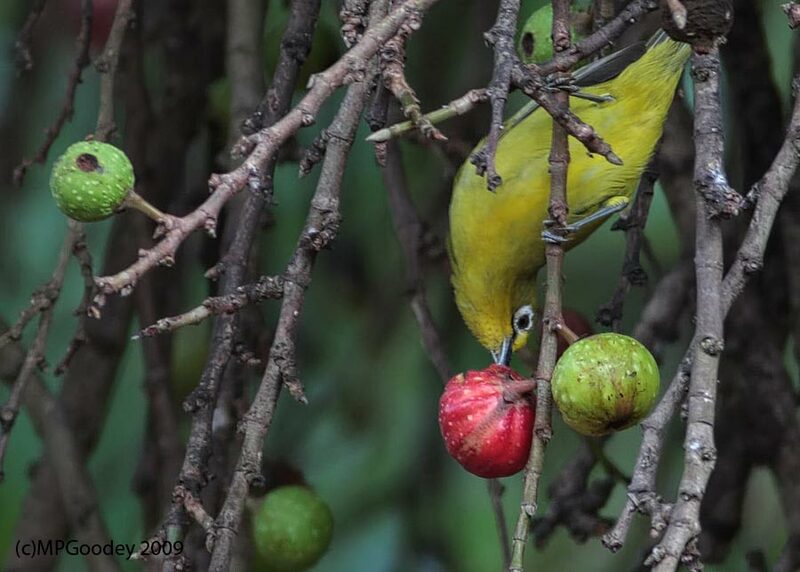 If I can help birds like these I will. I’ve got no further cash to fund yet more research. No more money for endless meetings between the good and the bad. I’m in no way content, not any longer, to entrust their future to a salaried caste of bureaucrats. Woefully corrupt or otherwise fallen. That’s why I do my biggest bit in the garden. Wherever that garden might be. Staggering, sweating, kneeling before the Mother of God. Until the last breath I take. Until that day when I can no longer raise my Faroffskis, nor hold these Mammoth secateurs. For Wonder, like Biodiversity, begins at home. Linnaeus was briefly here in June, and doubtless listening to Thrush Nightingales, nearly three hundred years ago. 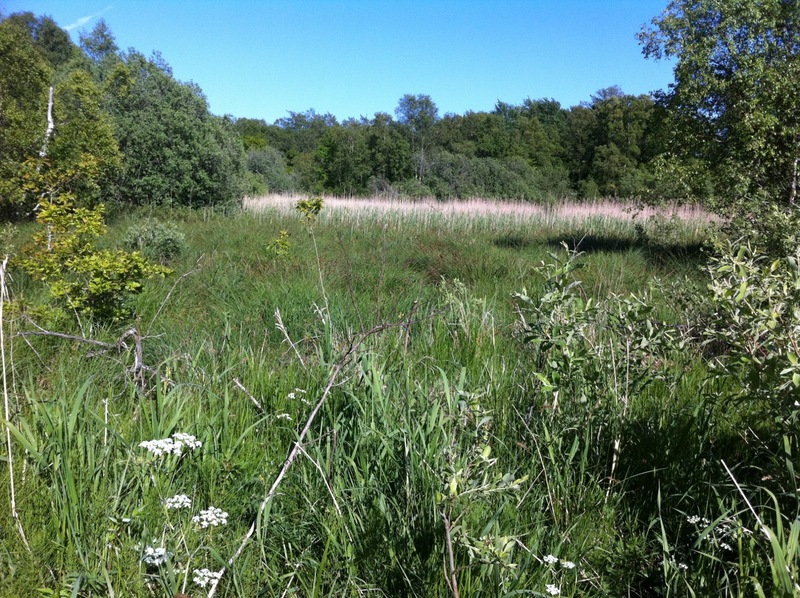 A swampy area in the forest at Ottenby, Sweden.